So You Think You Can Dance: Is the FOX TV Show Cancelled or Renewed for Season 15? Is it time for the big finish? Has the So You Think You Can Dance TV show been cancelled or renewed for a 15th season on FOX? The television vulture is watching for the latest cancellation and renewal news, so this page is the place to track the status of So You Think You Can Dance season 15. Bookmark it, or subscribe for the latest updates. Remember, the television vulture is watching your shows. Are you? A dance competition airing on the FOX television network, So You Think You Can Dance is hosted by Cat Deeley, with co-creator Nigel Lythgoe serving as judge. In season 14, they’ve brought back another original judge, Mary Murphy, and added Vanessa Hudgens, as well. The competition pits dancers against one another, in a bid to become “America’s Favorite Dancer.” This season, the FOX contestants will demonstrate their ability in various dance styles, including contemporary, tap, hip-hop, ballroom, animation, breaking, and more. The Top 10 will then be paired up with All-Stars who will guide them throughout the competition. 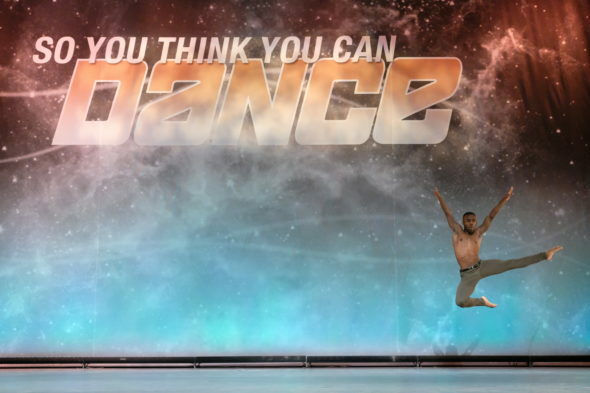 The 14th season of So You Think You Can Dance averaged a 0.71 rating in the 18-49 demographic and 2.75 million viewers. Compared to season 13, it was down by 8% in the demo and down by 7% in viewership. Find out how So You Think You Can Dance stacks up against the other FOX TV shows. On February 16, 2018, So You Think You Can Dance was renewed for a 15th season, to debut June 4, 2018 at 8:00pm ET/PT. Stay tuned for further updates. Last season, in an attempt to boost viewership, So You Think You Can Dance featured younger competitors between the ages of eight and 13, but the ratings fell even further. This season, the show went back to basics and showcases dancers between the ages of 18 and 30. The show got off to a good start but the numbers have dropped. At this point, I suspect the series will be back for a 15th season. Subscribe for free updates on any cancellation or renewal news. 2/16/2018 Status Update: So You Think You Can Dance is renewed for season 15. Details here. 3/20/2017 Status Update: So You Think You Can Dance season 15 debuts on June 4, 2018. Details here. Find more So You Think You Can Dance TV series news or other FOX TV show news. What do you think? Do you hope the So You Think You Can Dance TV show will be renewed for season 15? How would you feel if FOX cancelled this TV series, instead? MasterChef: Cancelled or Renewed for Season 10 on FOX? The Four: Battle for Stardom: Cancelled or Renewed for Season Two on FOX? The Mick: Cancelled or Renewed for Season Three on FOX? That was supposed to be “I love SYTYCD”. Don’t know how autocorrect came up with duty day for that! I love duty day. Watch it every year. What the dancers and the all-stars do is amazing. Bring it back. Especially glad they bought Mary Murphy back. It just wasn’t the same without her enthusiasm! The ratings for SYTYCD didn’t really plummet until the powers that be started messing with the formula. Last year was also so very short. Please return it to the original format Fox!! It is some of the only real dancing we get to see on network TV and I much prefer it to DWTS. How often do we really get to see contemporary dance? I miss the results shows that featured different types of dance groups and live music performances. I just love this show, please don’t cancel it. I sincerely hope that SYTYCD will return for its 15th season. Its’s the best dance show in that it features young dancers who are serious about their dreams and dedicated to perfecting their craft . So much more heart and purpose in this competition that the glitzy DWTS. And I agree with Cyd that it needs to go back to its original format. Come on FOX. Give these young dancers a platform to achieve their dream and viewers a great show to watch. Yes if it goes back to it’s original format, that would be amazing!!! This show has become a family thing, but the last few seasons, we have went and found other things to watch. I’ll never understand why Dancing with with the Stars beats SYTYCD in ratings except for a spiffier name & American obsession with celebrities. Have watched every SYTYCD show since its star. Such an entertaining, uplifting and joyous show. One of very few broadcast shows that I watch. I love SYTYCD! Please don’t cancel it! I love it because it’s one of the few reality shows where the contestants are not putting each other down, but uplift each other. cancel. Maybe too much emphasis on hip hop styles has lost viewers. I haven’t enjoyed the competition since the show began to pair dancers with the past winners / professionals! What was so exciting was that 2 contestants with equal ability have to outshine their each other but being a supportive partner regardless! I appreciate the past winners have the talent and can be a great mentor but when dancing with the contestant they can and do outshine and overshadow. Bring back the original please! I love SYTYCD! I have watched it from the very beginning. Would be disappointed if it gets cancelled. Maybe Monday night is not the best. Sometime competes with The Voice. Please don’t cancel! YES, PLEASE have season 15 back to original format!!!! We wish it would be back the way it was at the beginning. No All stars. Just teams of normal dancers paired up with different styles. No professionals either. Lex is part of Shaping Sound and that isn’t fair for dancers that are not already employed. I so agree with Karen!!! This is my favorite show of all time!!! I’m was a little disappointed the last few years and am so happy they are back to the original format. Dance is so powerful and this show by far showcases what humans can do with their bodies and minds! I am a huge fan of this show, so happy it’s back to the original way it used to be, and I’m happy Mary is back as well!! !